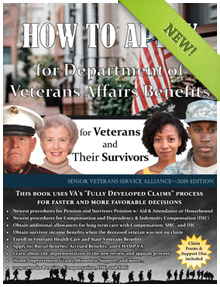 The Senior Veterans Service Alliance is excited to introduce this new how to apply book (2019 Edition) as a welcome and needed resource for veterans, their families, survivors, and for professionals who assist them. Advocates may or may not be accredited through VA. Non-accredited advocates understand veterans benefits but are not allowed to help in the filing of a claim. All advocates can answer questions relating to specific benefits and can direct a potential claimant to an individual or organization capable of filing a claim. These individuals do not charge a fee related to filing a claim. The individuals listed here are accredited through VA to represent veterans in an appeal of an adverse decision. These individuals have the expertise and a desire to help veterans with an appeal. VA does allow the charging of a fee for an appeal by an accredited agent or accredited attorney after a Notice of Disagreement has been filed. Home Care is health care or supportive care provided in the patient's home by healthcare professionals or by family and friends (also known as caregivers who give informal care). Often, the term home care is used to distinguish non-medical care or custodial care, which is care that is provided by persons who are not nurses, doctors, or other licensed medical personnel, whereas the term home health care, refers to care that is provided by licensed personnel. An attorney specializing in elder law helps older people and their families or caregivers with legal issues, estate planning and long term care planning. Many of these attorneys help individuals or couples qualify for Medicaid and preserve assets from Medicaid spend down and recovery. Property ownership, special transfer allowances, application for a fair hearing, Miller trusts and family-beneficial use of spend down monies are areas where their services can protect family members and healthy spouses from undue hardship. Medicaid planning has gotten a bad name because a handful of practitioners have abused the system and taken unfair advantage of taxpayers. But Medicaid planning is really a useful strategy and is typically needed to save what few assets are remaining for Medicaid spend down and to provide adequate income for the healthy spouse at home. Medicaid often robs the healthy spouse of a quality standard of living by not allowing enough needed assets and income. A financial planner or advisor who works with the elderly is going to understand how to invest assets for that age group. An awareness of various tax planning strategies is also an important part of planning for retirement years. This person will also understand how to use assets and income when there is a need for long term care. This person will work closely with an estate planning or elder law attorney to make sure all arrangements for the estate, for disability, for loss of capacity, for medical treatment and for long term care are covered. An elder financial advisor is also likely to work with a team of eldercare advisers such as care managers, pre-need funeral planners, long term care insurance specialists, experts on taxes, reverse mortgage specialists and home health providers. Also known as Geriatric Care Manager, Professional Geriatric Care Manager, Elder Care or Aging Care Managers, a Care Manager represents a growing trend to help full time, employed family caregivers provide care for loved ones living close by or living far away. Care managers are also particularly useful in helping caregivers at home find the right services and cope with their burden. Services from care managers should be something that every family takes advantage of, but in reality very few families use them. Care managers could go a long ways towards helping the family find better and more efficient ways of providing care for a loved one. The concept is simple. The family hires a professional adviser to act as a guide through the maze of long-term care services and providers. The care manager has been there many times. The family is experiencing it usually for the first time. Hiring a care manager should be no different than hiring an attorney to help with legal problems or a CPA to help with tax problems. Most people don't attempt to solve legal problems on their own. And the use of professional tax advice can be an invaluable investment. The same is true of using a care manager. The irony of not using a care manager is that most families, given the opportunity to use the care manager, think they can do it themselves and will not pay the money. Yet the services of a care manager will probably save them considerably more money then do-it-yourself. The cost of the care manager might be only a fraction of the savings the care manager could produce. Care manager services can also greatly reduce family and caregiver stress and help eliminate family disputes and disagreements. Care managers or independent placement companies help families find new living arrangements when loved ones can no longer stay in their homes. An assessment usually starts the process to determine what type of living arrangement is necessary. Once the appropriate level of care is determined, a list of recommended facilities will be offered. Additional services usually include a tour of the facilities, a presentation of facility costs and eldercare support available and an evaluation of family resources to fund the costs. Placement service providers sometimes offer additional relocation support, directly or through referral, for downsizing and moving services. The Department of Veterans Affairs offers a myriad of benefits to veterans. As a general rule, a veteran is defined as someone who served in the armed forces of the United States. Reservists and National Guard are generally not considered veterans for benefits purposes except under certain special conditions. For some benefits, up to 2 years or more of service is required. Certain members of the SVSA understand and can explain to you the various benefits that are available. A veteran or eligible dependent has up to 1 year from an adverse VA decision on any benefit to appeal that decision. VA decisions regarding health care are not appealable. After filing a Notice of Disagreement with the Regional Office, a person making an appeal can pay a fee to an accredited agent or attorney for representation before the Board of Veterans Appeals. Compensation is probably the most applied for benefit for all veterans and eats up about 40% of VA's annual budget. This is a disability income for veterans who are disabled because of service. Most senior veterans will have had an opportunity to apply for compensation earlier in their lives. However, some may be eligible who have never applied. Others who are receiving compensation may have seen an increase in their level of disability and can reapply for additional monthly income. Besides the additional income available from VA aid and attendance pension to cover long term care benefits, the VA healthcare system also offers a variety of long term care services. This could include nursing homes, assisted living, home care and so on. Eligibility requires enrollment in VA health care and preference is given to a priority list of conditions. Most people who have heard about aid and attendance Pension know that it will cover the costs of assisted living and, in some cases, cover nursing home costs as well. But the majority of those receiving long term care in this country are in their homes. Estimates are that approximately 70% to 80% of all long term care is being provided in the home. All of the information available about Pension overlooks the fact that this benefit should be used to pay for home care. Maybe if more people knew this fact, more people would be applying for the benefit. State veterans homes are a joint venture between state veterans departments and VA. Subsidies come from the state, VA and other sources. The majority of state homes are nursing homes for veterans but some homes may also provide assisted living and other care. Most states have anywhere from 2 to 5 or more homes. Typically there is a waiting list to get in. The VA healthcare system is the largest single provider of healthcare in the United States. It has also been noted by numerous surveys as being one of the best providers of health care as well. Not all veterans can receive care in the system. Eligibility requires either service-connected disability, special service recognition or low income and less than $80,000 in assets. This benefit is available as a one-time grant through the orthotics department in your local VA regional medical center. 2 benefits are available. One benefit for $4100 for veterans who are service-connected disabled and another benefit for $1200 for veterans who are low income or receiving aid and attendance pension. The HISA benefit is limited to the improvement and structural alterations necessary only to assure the continuation of treatment and/or provide access to the home or to essential lavatory and sanitary facilities. It does not include those improvements which would serve only to lend comfort to the individual or make life outside the health care facility more acceptable. Roughly 1 out of 4 seniors in the U.S. could qualify for the aid and attendance benefit under the right conditions. That's how many war veterans or their surviving spouses there are. Only about 5% of U.S. seniors are actually receiving this benefit. It can pay up to $2,230/month for a couple, $1,881/month for a single veteran and $1,209 for a single surviving spouse. Money is available for burial costs for veterans who were service disabled, receiving pension or died under VA care. If the death was a result of service-connected disability, $2,000 is available. If the death was non-service related, up to $600 is available for plot allowance and burial and funeral expenses. Veterans also receive free burial in state VA cemeteries. 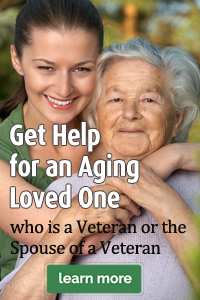 The following benefits are available to the surviving spouses of veterans. No person may help a veteran with an initial claim for benefits unless that person is accredited through VA. Additionally, no fee may be charged that is directly related to the filing of an initial claim. Doing so is illegal. Many members of the SVSA are accredited and no member of the SVSA charges a fee that is directly related to the filing of an initial claim. The Senior Veterans Service Alliance is a not for profit corporation that supports veteran members and sponsors eldercare related businesses (called listing providers) across the United States. We are not affiliated with the Department of Veterans Affairs. These individuals, among other things, are entitled to help from any of the individuals or services listed on this site (become a member). These individuals help veterans and their survivors understand VA benefits available to them. A number of these people are accredited through VA and as such can also help veterans with their specific claims. Appeals Agents can provide assistance with appeals for adverse decisions made by VA through applications for benefits. Our Listing Providers concentrate primarily on helping senior veterans and their survivors, but they will help all veterans who come to them.